Smiles, hugs and laughter -- the signs of friendship and camaraderie -- this is what you'll see at a Girl Scout Troop 40988 meeting. The room is filled with girls in blue and brown vests adorned with brightly colored patches. They're working together and having fun. The energy is palpable. At a meeting I recently attended, the girls were learning about each other through investigative journalism. Using pens as mock microphones, they interviewed each other and took notes on their new-found knowledge of their friends. Interviews complete, we gathered as a group and each girl shared their favorite thing about Girl Scouts. "I like meeting new people and getting to hang out with my Girl Scout sisters," said Aniyah Martinez. "I like making new friends and going to Girl Scout camp. Girl Scouts is an amazing experience," added Hannah Jaburek. "I like learning new things like healthy habits and how to respect others," Hailey Didway shared. Other favorites were going on adventures and attending events like last year's Halloween party. Coloring, having snacks and earning badges also made the list. The badges are, in fact, a very big deal. Ask which one is their favorite and see faces light up as they point out their most cherished patch and tell you how they earned it. It might be their Pajama Party, Bugs, Horseback Riding, Say No to Bullying or It's a Girl Thing badge. Many loved their Tea Party patch earned by hosting a farewell party for a troop member who moved. Other favorites were the Explorer badge earned on a visit to Northwest Trek Wildlife Park and the Teen Titans patch earned on a field trip to the movies. As they shared stories and showed off badges, troop leaders Amber Jaburek and Denisse Maya beamed with pride at these girls they've taught and helped grow. The meeting ended with a Girl Scout circle. The girls cross arms and hold hands, then make a silent wish and pass it on with a squeeze of the hand. When done, they say "goodbye Daisies and Brownies" and twist out of the circle. 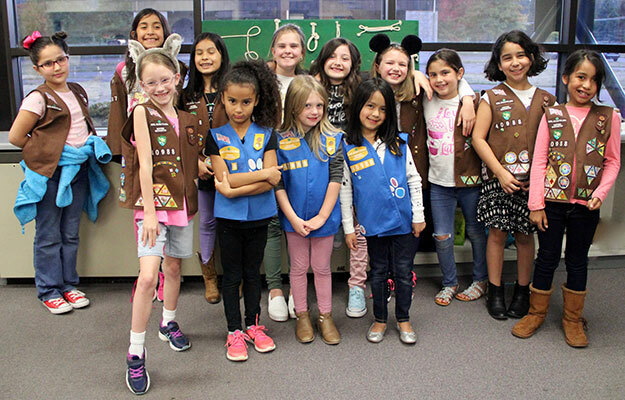 Troop 40988, a Daisy and Brownie troop that meets at the Fort Lewis Girl Scout Hut Thursdays at 6 p.m., is one of many Girl Scout troops on and around Joint Base Lewis-McChord. Every troop is different. Leaders plan activities and outings based on the girls' interests. "The beauty of Girl Scouts is we have so many choices like STEM-themed activities such as robotics and cyber security or outdoor activities like hiking and camping," said Jaburek. "It's mostly about bonding and giving the girls the skills and confidence to be strong and successful." Troops also give back to their communities with events like Operation Cookie Drop, where they take holiday treats to gate guards, police and hospital employees who work on Christmas Eve. They've also done cleanup projects for Earth Day and are currently working on a school supply drive. Like most nonprofits, Girl Scouts rely on volunteers to make things happen. Parents and other volunteers serve as troop leaders, assist with events and teach skills. Background checks are required of all volunteers. Any girl in grades kindergarten through 12 can join Girl Scouts. To find a troop in the area, send a message on facebook.com/GirlScoutsWW. You can also contact Girl Scouts of Western Washington at 800.541.9852 or sign-up online at girlscoutsww.org.